My eyes are the kind that gravitate towards anything sparkly, I'm pretty traditional when it comes to my nails, they are usual coated in reds, pinks and burgundy's, until I came across this polish from Pop that I fell in love with and couldn't wait to slather my nails in I ended up painting my nails in the office! Apart from being an absolute pain to remove, it's perfect - applies opaque and only need two coats. The shade Lavender Glitz has three shades running through it, lilac, blue and silver, which I love. It's a bore and a half to get off but oh my gosh, the way it catches the light is so beautiful - I absolutely adore it! After my first dip in the sparkly nail pool, the prospect didnt seem so daunting - my latest acquisitions are Models Own Southern Lights, which reminds me a more lilac version of Pop. Part of the new Nails Inc AW collection is the shade, Sloane Gardens, which is a much more subtle and sophisticated glitter. 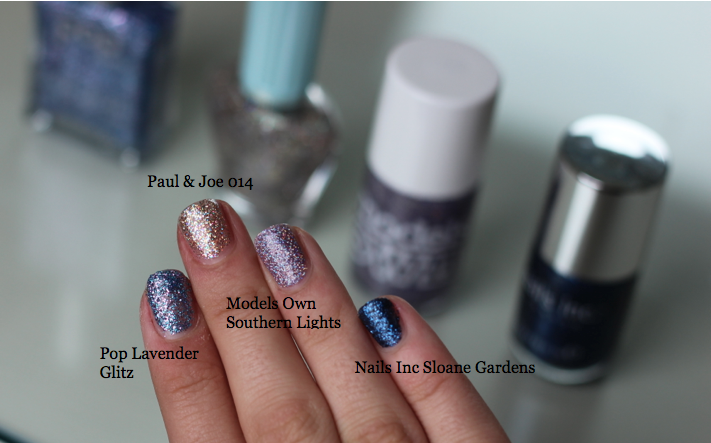 Lastly, Paul & Joe 014, which the packaging I simply adore but as the glitter is less opaque I would pair it on top of another shade. I'll either be sporting this Estée Lauder polish or glitter nails this Christmas season, both of which are such simple ways to make a statement and perk up an outfit.